The new Honda HR-V Hatchback must be the envy of its rivals. And if you own one before any of your neighbours, you could be the envy of your street. It’s a big, spacious Hatchback that boasts more equipment and room than its competitors. But despite its size, it’s also incredibly stylish. In other words, it’s neither one nor the other – it’s both at the same time. It’s rugged and a total babe. It’s also confident on the road, goes well with a full load, and has an upmarket interior. OSV takes a closer look at what it’s all about with our 2017 Honda HR-V Hatchback review. Big hatchbacks are either known for their sporty prowess on the road, or their high levels of comfort. The Honda HR-V is the latter. It’s smooth and soft, and its suspension is able to cushion you from broken roads like a pillow. There is a fair amount of body lean, though. You won’t always feel it, but if you approach bends with too much enthusiasm, your passengers certainly will. The steering is accurate and light enough, but it often feels too artificial. As such, you never feel fully involved. You can choose between a CVT automatic or a 6-speed manual transmission. We prefer the latter. It feels better in your hand, thanks to its stubby and stocky gear level. It also shifts gear smoothly, and offers more speed. The CVT automatic seems to sap more power on the move, although it is more economical. In terms of the engines, a 1.5-litre petrol engine can get you from standstill to 62mph in 10.2 seconds. That’s if you pair it up with the manual ‘box. Pair it up with the automatic, and that time increases to 10.9 seconds. The engine also gets noisier. The 1.6-litre i-DTEC diesel is a stronger choice. This British-built engine is cheaper to run, and does 0-62 in just 10.0 seconds. It’s not got as much power as the petrol engine, but if you’re a high-mileage driver it should just about do all that you need it to do. The interior is one of the HR-V Hatchback’s strengths. Everything is well laid out, and it even feels plush and upmarket. The seats are comfortable, and you should feel nice and relaxed on the move. The only thing that can dent your bliss is an overly noisy petrol engine that’s paired up with the CVT automatic. The materials are built to last and feel solid, but there are cheaper plastics in here too. Not many, but if you look hard enough you will spot them. For example, the doors’ fabric inlays look past their time. Still, the dashboard taken as a whole should be praised. The design is bold, and we love the gloss black inserts. The soft leather steering wheel is also a classy touch, and it feels smooth in your hands. We also love the single-touch sensitive panel that adds to the upmarket feel. The centre console cocoons you like you’re in a Mercedes, and all the buttons are within easy reach. The instruments are clear, too, and it all makes up for a hassle-free, pleasant experience. Our only criticism is the black-and-grey colours. For some, they’ll be unnecessarily gloomy. Others, however, will prefer these neutral tones. Everyone will appreciate how practical this car is. Head and legroom won’t be a problem for anyone under 6’2”, and we love the flexible seating system. It’s known as Hondas “magic seats,” and it lets you fold the rear seats by their base. This means they fold like cinema seats, which then lets you easily load taller items. You can also fold them totally flat for more boot space. Speaking of boot space, you get 448-litres when all the seats are in place. Fold the rear seats, and you can extend it to 1,026-litres. Compared to rivals, that’s not exactly generous. Standard equipment is good across the range. The entry-level S trim comes with a DAB radio, Bluetooth and cruise control. It also gets climate control, automatic city braking, and automatic wipers and lights. 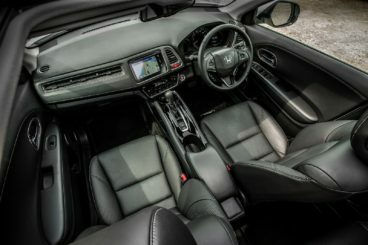 The SE model adds 17” alloys, rear and front parking sensors, and Honda CONNECT. The SE Navi trim throws in sat-nav, while the EX rounds things off with fully heated leather seats, a reversing camera, keyless entry and LED daytime running lights. Standard safety kit across the range, meanwhile, includes lots of airbags and electronic stability control. The brands City Brake System is also here. It prevents you from crashing into the car in front by braking at low speeds. Move up the trims and you get more safety kit. Traffic sign recognition, lane departure warning and forward collision warning are all added to the SE and EX models. It’s also worth mentioning that the car bagged all 5 stars when it was crash tested by Euro NCAP. Prices for the new car start out from £19,600 and rise to £27,100. For more information on our leasing deals, check out our page here. In terms of its running costs, the car does well. They certainly help to take a bit of an edge off the high listing price. Indeed, Honda intended from the start to make the HR-V Hatchback one of the most affordable-to-run hatchbacks’s around. However, exactly what the mpg figures will depend on which alloys you pick. The 1.6-litre diesel engine is the most frugal, with Honda claiming that it can return 71mpg with 17” alloys. Opt for the bigger 17” alloys, and that number will tumble to around 68.8mpg. The tax bill remains the same for either set of alloys, and you’ll pay £20 a year. The 1.5-litre i-VTEC petrol engine is unsurprisingly more expensive to run. It can average 50mpg with the manual gearbox, and 52mpg with the automatic. Taking on cars like the quirky Nissan Juke means the HR-V needs to be sorted in the looks department. Honda has suited and booted it well. Its interior is easily bigger than most rivals, which is a huge strength. The rear seats are so easy to fold, and let you easily load taller items. Lack of a four-wheel-drive model could be a deal breaker for some. Compared to rivals, the HR-V is pricey. Its low running costs might not be enough to help you balance the books, either. Let’s see how the car compares against its rivals in the comparison section of our 2017 Honda HR-V review. The new Citroen C4 Cactus is a car for families who want to be individual on the road. Its funky exterior stands out in this class, and it comes with some neat features. 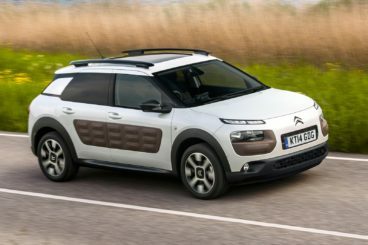 Despite its somewhat flamboyant design, the Citroen C4 Cactus Hatchback is more of a comfortable cruiser than an exciting drive. The lightweight design contributes to its comfort, as do the softer springs. As such, it’s a return to the kind of comfy motorway cruisers than Citroen were known for. There will be a significant amount of roll in bends, but you can still have a giggle on twisting lanes. It’s also at home in the town, where its light steering proves useful. We’re not too keen on its gearbox, though. Widely-spaced gears and a lurch when you make a shift are not appealing. In terms of the engines, you can’t really go wrong. They’re all up to the thankless task of hauling the C4 Cactus along on a full load, and it’s hard to choose between them. If, however, you want as relaxing a drive as possible, you’ll want to avoid the noisier, smaller diesel. The PureTech 110 is probably our top pick if we’re pushed. Capable of doing 0-62 in 9.3 seconds, it’s nippy and quiet. Running costs are excellent. According to Citroen themselves, if you pair one of the BlueHDi diesel models up with 15” wheels, you can in theory return 90mpg economy. That’s staggering. The 1.2-litre PureTech petrol engine also has astonishing fuel economy, and can return 65.7mpg. All models cost £140 to tax. Things just get better once you step inside the car, where you’ll be met by a stylish design. Sure, there are one or two cheaper plastics, but we reckon that won’t be a deal breaker for anyone. The overall layout is simple but eye-catching, and you just don’t get dashboards as stylish as this anywhere else in this class. It’s also a practical car. There is more interior space than there is in most rivals, and the 358-litre boot is one of the biggest in this class. Fold down the rear seats and you can extend that to 1,170-litres. Storage spaces are plentiful, and include a big top-loading glove box and door pockets in each of the doors. The new Nissan Qashqai Hatchback was one of the most popular large Hatchback’s last time round. But has it still got what it takes in its second generation? To stay competitive, Nissan has had to ring the changes a tad. It’s a bit more entertaining to drive, thanks largely to a suspension that does well to resist body lean. Moreover, the somewhat heavy steering doesn’t twitch as much as it did. Active Ride Control prevents that horrible down-and-up motion that comes from riding over bumps. Other technical achievements include the Nissan Qashqai’s ability to brake each wheel separately for some stability when you corner. In terms of the engines, OSV likes the 1.5-litre diesel. It’s far from being the quickest of the bunch, but it’s a solid motorway cruiser. It does 0-62 in less than 12.0 seconds, which seems reasonable for a family car like this. Other engines for your consideration include a nifty 1.2-litre petrol engine. It’s quiet and cruises well, but without much power, it’s not the best at overtaking. 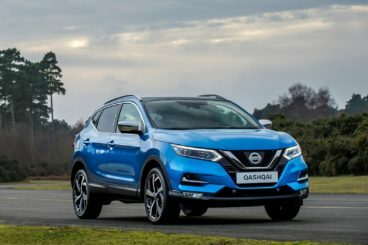 Despite its size, the Qashqai offers hatchback running costs. Day-to-day, it shouldn’t cost you any more than the HR-V. The cheapest engine to run is the 1.5-litre diesel that can return 74.3mpg and which is free to tax. The petrol engines are significantly pricier, with the 1.2-litre good for 50.4mpg. It comes with a turbocharger, though, which boosts power. Inside, the Nissan Qashqai’s interior is smart, modern and comes well-equipped. Thanks to a raised ride height, visibility is fantastic, and the overall build quality is impossible to fault. Nissan has even thrown in lots of soft-touch plastics, which elevate its sense of occasion. The adjustable steering wheel and driver’s seat make it easy to get comfortable, while all seats offer enough support. Practically-speaking, the Qashqai is good. It looks bigger than the Honda, but it really isn’t. It’s easy to park, easy to slot into your garage, and offers an almost panoramic view of the road. Parking sensors are an optional must-have, while entry-level models miss out on the side, rear and front colour parking cameras. These will improve its usability. Head and legroom are excellent, though a panoramic glass roof does diminish rear seat headroom a little. The boot measures 430-litres, comes with a false floor, and no boot lip. The HR-V was actually the original small crossover SUV. But has it stood the test of time in the wake of so much hot competition? It has! With its slick looks and upmarket interior, it’s a classy car. 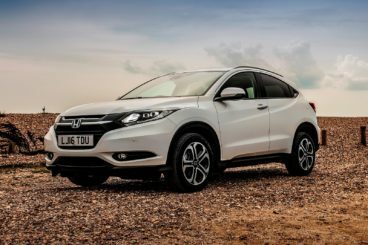 With more space than rivals, “magic seats” and super low running costs, the Honda HR-V should be the first name on your shortlist.